HomeKit is one of the most mysterious features of iOS 8, because when Apple unwrapped it at WWDC in June, the company was really talking to developers. Craig Federighi teased what consumers would someday be able to do with it, but HomeKit is sort of like iOS 8’s version of Passbook: Apple is providing the framework but developers of both software and devices are going to have to take the ball and run with it. And those developers are already going long. The connected home market has been heating up lately, with exciting devices like Nest and Philips Hue giving us glimpses at a Jetsons-like future of homes that anticipate and react to our every need. Big box retailers like Home Depot and Best Buy are jumping in, dedicating retail floor space to their own DIY systems, and companies like Google and Samsung are snapping up startups left and right. Thanks to the popularity of iOS, Apple’s involvement could help the smart home market grow by leaps and bounds. Smartwatches might be getting all the attention right now, but this is a fascinating time for connected home—well, fascinating and maddening both. There are just too many systems that don’t work together, and it’s hard to know what to buy. Users can start with one-off products to meet individual needs—a light here, a lock there—or go for a more complete system of interconnected products. And to further complicate matters, those systems can be DIY-installed like Lowe’s Iris, Staples Connect, and Home Depot’s Wink, or they can be professionally installed and managed, like Xfinity Home and ADT Pulse. These different products also use different wireless communications protocols, such as Z-Wave, Zigbee, Insteon, and plain old Bluetooth and Wi-Fi. Products that use different protocols don’t talk to each other, and each device or system typically comes with its own app—unless you add a hub like SmartThings or Revolv. These hubs contain multiple wireless radios, so your iPhone can talk to the hub, which then sends commands to the connected devices. That way you can group products together and control them from one app, for a more seamless experience. You can expect most smart-home device makers to add HomeKit support to their product lines, unless they're already exclusively tied to a major competitor. Apple teased some partnerships at WWDC. Apple hasn’t announced its own hub, but the company did say at WWDC that HomeKit is designed to let iOS users securely connect to their devices and group them together to control as a single "scene." (Think of a scene like a preset for an activity that, once invoked, adjusts multiple devices at once. You could tell Siri you’re going to bed, for example, which could trigger a multi-device action: your lights fade out, your door locks, and your thermostat nudges down to your preferred sleeping temperature.) The hub can’t be the iPhone itself, or you’d have no way to check in on your house when you’re not there, but Apple already has an always-on, Wi-Fi and Bluetooth-equipped piece of gear that could possibly stand in: the Apple TV. Chris Breen makes an excellent case why a souped-up Apple TV could work as a HomeKit hub. HomeKit will enable connections between all kinds of devices, even a smart USB charger like the Powerslayer from Velvetwire. Now why would a USB charger need Bluetooth LE? Powerslayer chargers already have embedded software to detect when a device is fully charged and stop the flow of power. Bluetooth will allow for even smarter, interactive charging, so you can tell the charger through an app that you're in a hurry, and get extra-fast charging from the “quick boost” feature. A Bluetooth Powerslayer could even act as a HomeKit-compatible power strip for small USB-powered devices. That way, a tiny company that wanted to make a USB lamp wouldn’t need to go through the whole HomeKit device certification process, and FCC wireless clearance. They’d just have to write HomeKit software for iOS that could communicate with the device over the Powerslayer’s Bluetooth. 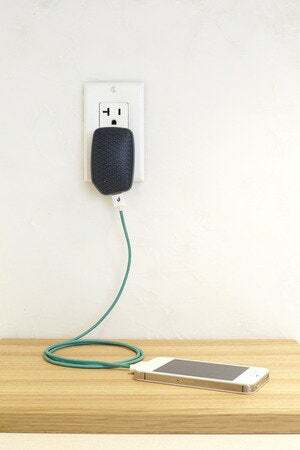 Add battery backup to that lamp, and Powerslayer could make sure to charge that battery at night when electricity is cheaper, adding an extra layer of efficiency. 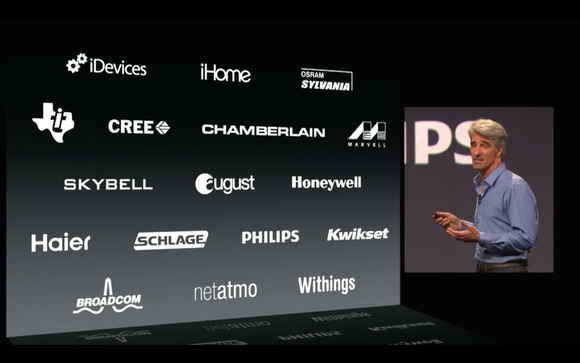 As more companies announce their HomeKit plans, expect more surprising “I never would have thought of that” moments. All Apple will have to do is devote some retail space to the best and brightest HomeKit-compatible gadgets, and maybe roll out a heart-tugging commercial or two showing happy iPhone users being embraced by user-friendly homes of the future. Well, then there’s just the little matter of convincing users that these things are not just convenient but also absolutely secure.